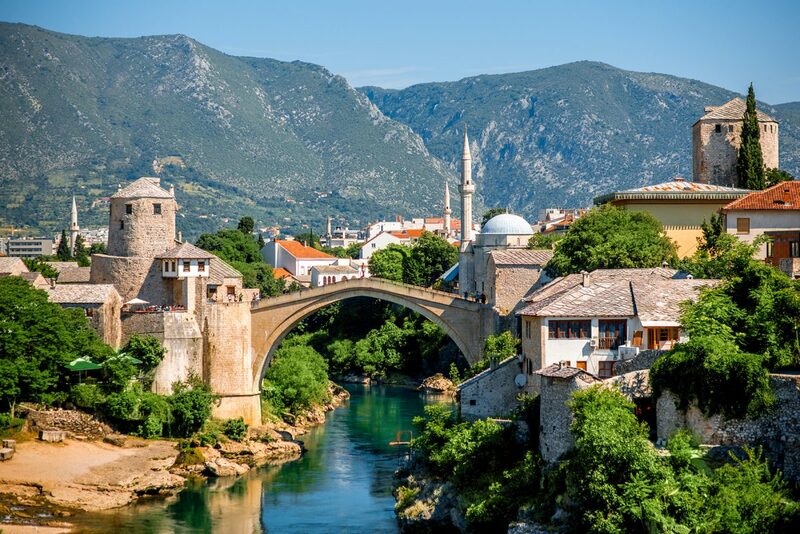 If visiting Mostar hasn’t made your bucket list yet, find out why it should, starting with this iconic UNESCO World Heritage Site, Stari Most. The story goes that Stari Most was held together with metal pins and egg whites, and to this day remains an unusual yet impressive design. The bridge was commissioned by one of the most famous Ottoman sultans, Suleiman the Magnificent, in the 16th Century. Before this the two sides of the town were connected by a swaying wooden bridge that put its pedestrians in mortal fear for their lives as they crossed the rickety wooden planks. 2.It has links to one of the greatest Muslim architects in the world. The architect who designed the bridge was Mimar Hayruddin, a skilled workman in his own right who was also a student of Mimar Sinan. Mimar Sinan is considered the most skilled architect of the Ottoman Empire. 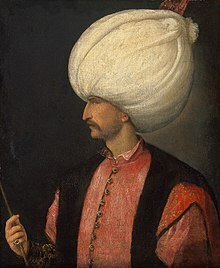 Born to Christian parents, Sinan converted to Islam and dedicated his life to serving the Ottoman royal house, most notably Sultan Suleiman. It is said that on the day the bridge was to be unveiled to the Sultan, Mimar Hayruddin was preparing his funeral shroud. He was convinced that once the scaffolding came off the bridge it would collapse, leaving him in bad favour with the sultan! Despite Hayruddin’s fears, the bridge did not collapse. In fact it stood proudly and powerfully over the Neretva river for 427 years, until it was shot down by Croat forces during the Bosnian war on 9 November 1993. 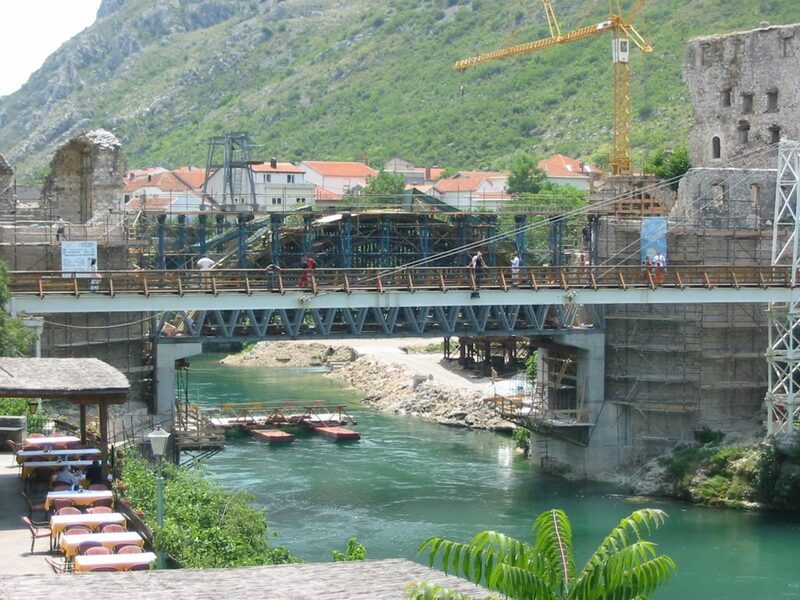 Reconstruction of the bridge began in 1997 and followed exactly the same building techniques that were used over four centuries earlier, so as to preserve the integrity of the original Stari Most. Possibly the world’s oldest diving competition takes place every year from this iconic UNESCO World Heritage Site. 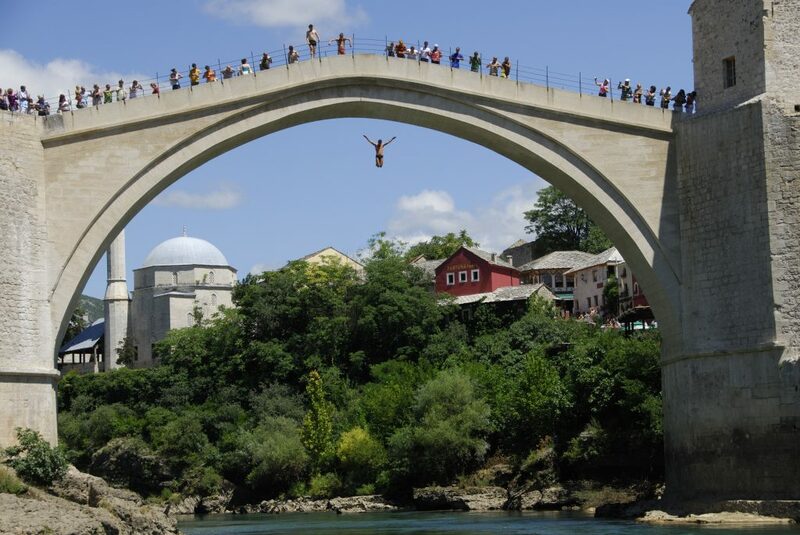 Young men jump from the apex of Stari Most into the river Neretva, in a ritual that signals their transition into manhood. Even though the competition is held at the height of summer, the water is still very cold, and the jump is a dangerous one. Before competing you are expected to have completed proper training. In fact, this extreme sport is also part of the Red Bull Cliff Diving World Series. But this is more than just a competitive sport. This rite of passion goes back hundreds of years and unifies a town that stills bears the scars of the recent civil war. 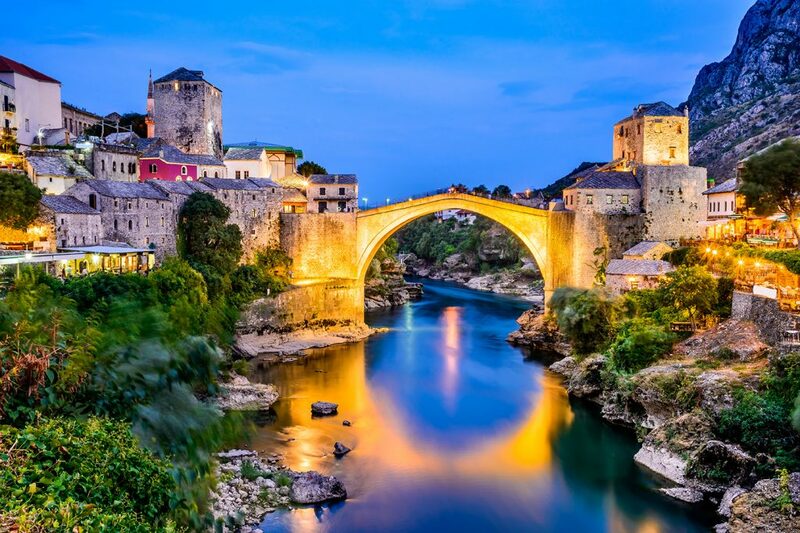 Few bridges are built without foundations, let alone one as beautiful as the Stari Most. When it was completed in 1566/67, the bridge had the widest arch in the world and was a masterpiece of Ottoman architecture. So much so, that the city of Mostar is actually named after the bridge and is derived from the Slavic word – mostari ­– for ‘bridge keepers’. If you decide to add Mostar to your travel plans this year, stop for a coffee at the Urban Grill, where the view of the Old Bridge is breathtaking. Have you visited this iconic bridge? Check out what else you can do in Mostar!